32. 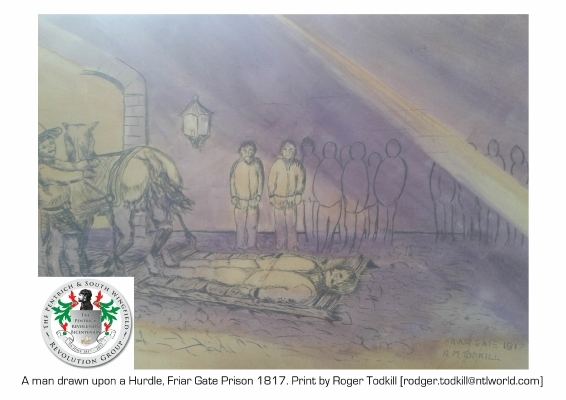 Man Drawn on a hurdle Friar Gate Prison. On Sunday 2 November 1817, the warrant arrived confirming the death sentences of Jeremiah Brandreth, Isaac Ludlam and William Turner. 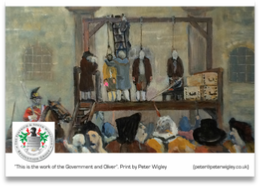 These were to take place on 7th November, and the full punishment was to be drawn to their place of execution on a hurdle, a wooden sled like vehicle, and after death from hanging, to be beheaded and quartered. The last part of the sentence was remitted. Before going to the gallows, the condemned men, "looking like walking spectres", were visited by a blacksmith who knocked off the irons they had worn since conviction and replaced them with sets that had a lock and key, making it easier to remove them after death. As Brandreth tumbled onto the hurdle to be dragged round the prison yard in the presence of all the other inmates (including debtors), he called out: "Hold my hand or I shall fall off." As he passed the others he said "God be with you and with me too." William Turner's brother, Edward, broke down and had to be removed. Edward was later transported to Australia. Lived in the Swanwick-Alfreton area. So to be asked to paint one part of this local historic event was deemed a challenge. I paint surrounding village landscapes in traditional watercolours and now have expanded into British wildlife (birds). 33. “This is the work of the Government and Oliver”. This picture shows the city of Derby. At 10 a.m. on 7th November, a detachment of the Enniskillen Dragoons marched to Nun’s Green. Their assigned duty was to keep carriages from passing that way till after the execution. During the execution they were especially charged to keep the public at a distance. The drop was enclosed by special constables and in the rear of these, the javelin men on horseback took their station. Several constables were placed in different situations near the prison for the purpose of stopping any disorder, but there was no indication of any attempt at a rescue for Brandreth, Turner and Ludlam. 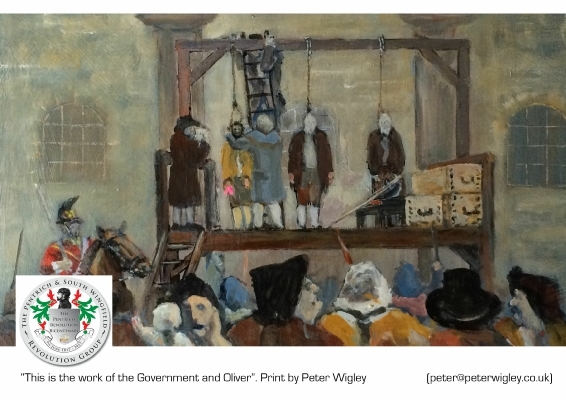 William Turner's last words were “This is the work of the Government and Oliver”, pointing the finger squarely at the government trick and the work of agent provocateur William Oliver. The three men were buried in an unmarked grave at St Werburgh’s Church, Derby. Born in Derby and now living in Duffield.I started watercolour classes in 2001 after taking early retirement. I soon became addicted to painting, mainly landscapes. These days I prefer to use oil and acrylic mediums in preference to watercolour. I exhibit my work locally and in a gallery at Criccieth, North Wales. 34. Alone without their menfolk . Although no women actually took part in the Pentrich Revolution, women would have suffered alongside the men beforehand, watching their children die through extreme poverty and starvation. 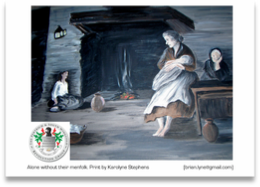 After the rising, the women – some of whose husbands had been transported or executed – were turned out of their houses with no men to take care of them. 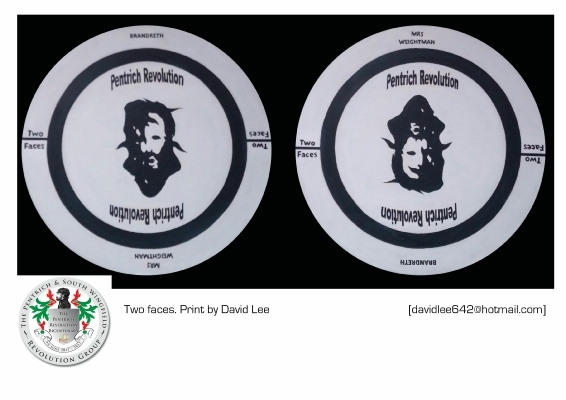 Many of the families that took part in the revolution were related, which would have affected the families even more as fathers, sons, uncles and nephews would all have been arrested. 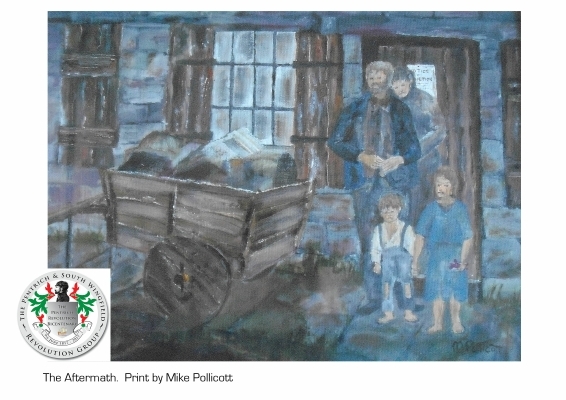 This had a devastating effect on the women left behind to fend for themselves, many with large families, particularly in the two villages of Pentrich and South Wingfield. My name is Karolyne Stephens, but most people call me Lyne. I have been painting on and off for about 15 years. Mostly with watercolour but am enjoying using acrylic paints. I didn't think I could give the impression of abject poverty and despair with watercolour. 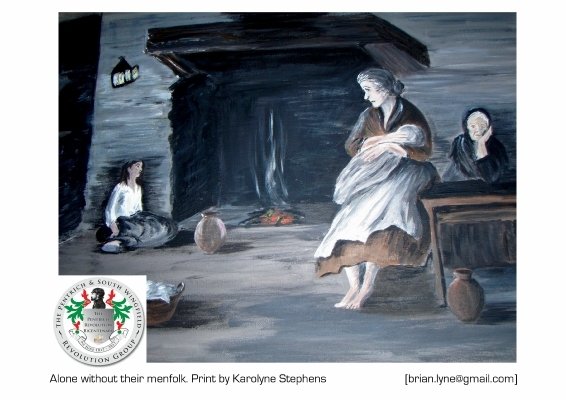 I did some research online about women in the early 19th century and found a lot of images of the poor and destitute. I thought this particular image showed four generations of the same family. This may have been reflected by the Pentrich women and the other local village involved in the Revolution. I found it a fascinating subject albeit a rather tragic one, to be involved in. Hope it proves to be worthy of the exhibition. 37. Retribution Hulk - Sheerness. 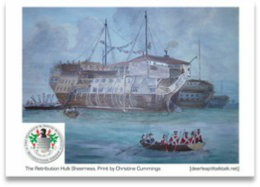 After they were sentenced to transportation to New South Wales, Australia, ten of the fourteen convicts were moved to Sheerness. 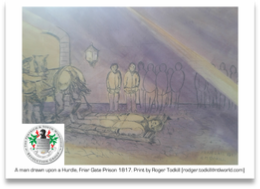 On Friday 28th November 1817 the first ten of the fourteen prisoners were transferred from Derby prison to Newgate in London and from there to the Retribution Hulk in Sheerness. The other four were too unwell to travel at that time. 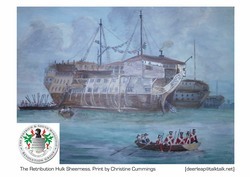 The first ten men left the hulk during the week before Christmas and boarded the convict ship Tottenham. However, due to storm damage, the Tottenham did not properly start the voyage for four months and the four men who had been ill arrived in New South Wales aboard the Isabella a month ahead of the ten. The Isabella arrived on the14th September 1818, and the Tottenham in October 1818. The men aboard the Tottenham were to spend almost a year aboard the ship before setting foot onto dry land again. Most of the men suffered some illness aboard ship, but none were reported to have misbehaved or punished for misbehaving. 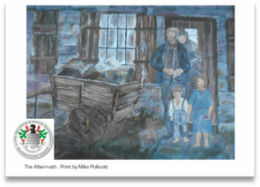 I am a member of the U3A art group which is held at the Pentrich Village Hall once a week. 35. The Spirit is not extinguished. 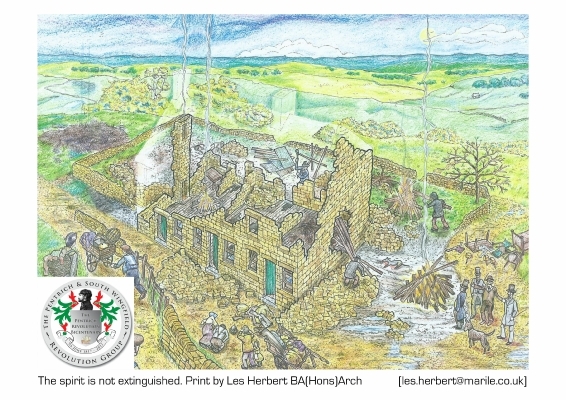 After the revolution had taken place, the Duke of Devonshire ordered the demolition of around one third of the village of Pentrich, turning out the families of the men who took part in the revolution, causing even more misery to these families. Most fled to nearby Alfreton and Ripley, some going further afield. The White Horse was one of the buildings demolished, as well as the house of Thomas Bacon, on the site of which the village school was later built. The village school now acts as Pentrich Village Hall. The population dropped from 726 in 1811 to 508 in 1821. The decline continued, and the population today is a little over 200. 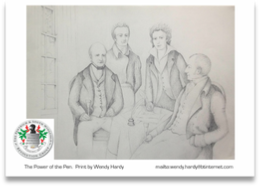 The year after the rising, in April 1818, the Duke of Devonshire visited Alfreton Hall and expressed his wish to call on his tenantry in Pentrich and was shown the route that the marchers took. On riding out of the village, "the Duke left a bountiful sum to be distributed among the poor at large", returning to Alfreton Hall "highly pleased by his excursion". I’m an Architectural Designer and help run a Design and Build business down in Kent. My wife Valerie and I moved to Derbyshire last year; home is where the heart is. As much as I still love designing buildings, I hope that I can now pursue art as my first love. 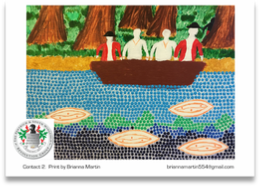 This painting represents the Australian Aboriginal culture. The transported men were astonished at the parrots which were snared during harvest time and other assorted birds which hung in cages near people’s front doors. They were even more astonished to hear some of them talk. The magpie belonging to Captain Piper could be heard half a mile down the harbour on a still day. On most street corners and outside some houses people sold all manner of fruit; oranges, lemons, limes, figs, grapes, peaches, nectarines, apricots, plums, apples and pears, all at reasonable prices. There was an abundance of fish caught at the head of the harbour by the Aborigines and hawked in the streets by retailers. They would also have been amazed by the local aboriginal people. as they would never have seen the near naked, dark skinned men before. I am fifteen years old. I live in Gloucester, NSW. Australia. I am 5th generation of Samuel Hunt, 5th generation of the Aboriginals that would have been here at the time and I am also a descendant of a Scandinavian Duke. I have two sisters and I live on a farm. I am currently in year ten at Gloucester High. 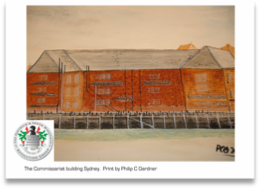 Samuel Hunt and one other convict with two soldiers going from Sydney Harbour to Parramatta. The oval shapes in the water represent fish. After two weeks at sea and leaving England, the leg irons that were put on the convicts in the hulks were removed. These irons were made from rod iron of about half an inch diameter with a lighter chain and a central circular ring. The irons were riveted on and sat on top of the shoes when walking. A strip of leather or stout string was tied to the central ring and one's belt so the chain didn't drag. Convicts were allowed up on deck at the discretion of the Surgeon Superintendent of the voyage. Some surgeons only allowed half the convicts on deck at any one time, while others allowed more as long as they didn’t interfere with the running of the vessel. Some convicts were encouraged to perform some of the seaman's duties as long as they didn’t go aloft. Permitting convicts on deck allowed them to exercise and gave time for a thorough ventilation, washing and cleaning of the prison below. Convicts were fitted with leg irons again if they misbehaved and this proved to be a deterrent to bad behaviour. When the transport arrived at Rio de Janeiro and Cape Town for supplies the convicts were again placed in irons as a precaution against them swimming ashore. 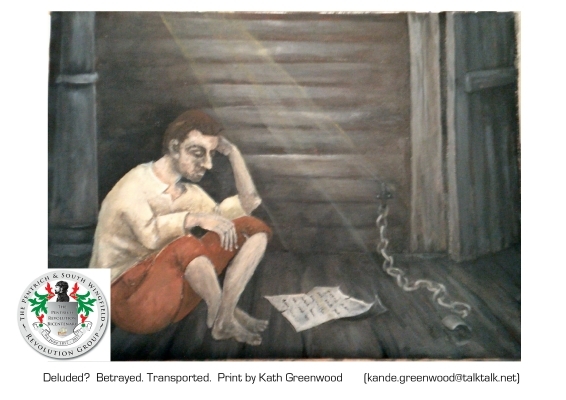 On board the convicts sorted themselves out according to where they came from into two rival factions – townies and yokels – and also according to their religious convictions – Protestant or Catholic. I am retired and have always been interested in sketching and painting purely as a hobby. We run an art group at our local church in Stonebroom on Monday afternoons where we are all enthusiastic amateurs. 41. Transportees working in Australian quarry. It was a generally the case in the penal colony for the master to put a new assignee to the hardest work they could before taking them into the house in the hope that the contrast between the past hardships and the current comforts would produce a good servant. Had he been at once received into the house, he may have misbehaved and destroyed any future prospects in the colony. 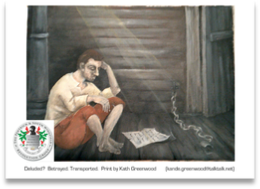 A convict who misbehaved after transportation had very little chance of ever proving himself as an honest subject. He was flogged and sentenced to a penal settlement, to a period of debased servitude among the vilest of the vile and was sneered at even by his old associates who may have risen to respectability in the colony. The aim was to produce well behaved good workmen. Four of the men died in servitude before receiving pardons in January 1835 – Thomas and John Bacon, Josiah Godber and Joseph Rawson. Thomas Bettison had served his sentence of fourteen years before the pardons were issued and became a freeman. The other nine men all received pardons due to the fact that family and friends in Derbyshire were still petitioning for their pardon. The only man to reoffend was Samuel Hunt, who received a second pardon in 1858 after being found guilty of sheep stealing. Jeremy Duffield was born in Alfreton and now lives in Heanor. 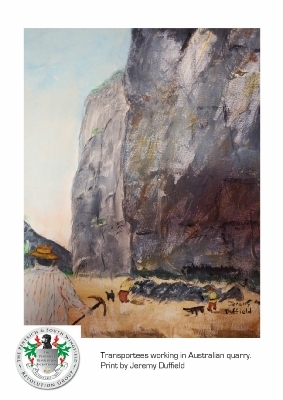 Although his main leisure interest has been writing - poetry, short stories and plays - he has dabbled with painting from time to time throughout his life. A few years ago he began sketching people in cafes instead of writing poems about them. 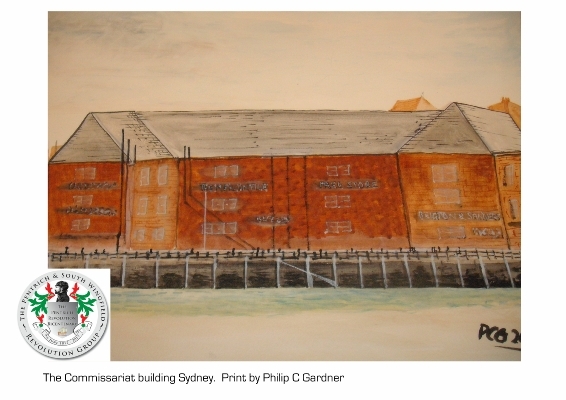 He now spends more time drawing and painting than he does writing and is a member of the Derby Sketching Club. 40. First Steps in the Ocean. For the first time in their lives, Thomas Bacon and George Weightman were used to the smell of the salty ocean. Now they could walk along a golden sandy beach as well. In September 1823, George Weightman walked out of Sydney on the Parramatta Road towards Liverpool and then Campbelltown some 32 miles to the south west of Sydney. This was the usual first stop out of Sydney, and George needed to find accommodation for the night. The track to Illawarra continued on to Appin and then into the thick brush above Bulli where he would have arrived around sunset. The view from the edge of the escarpment is spectacular. The road down was so steep that people had to stop themselves against the trees which towered overhead and excluded the light. Drays were let down gradually by ropes wound round the trees while the bullocks remained in the shafts. George headed across the flat towards the roar of the ocean which could be heard in the distance. To proceed further south he had to walk along the beach. All of the men from landlocked Derbyshire would never have seen the sea before their convictions, let alone been able to walk in it. 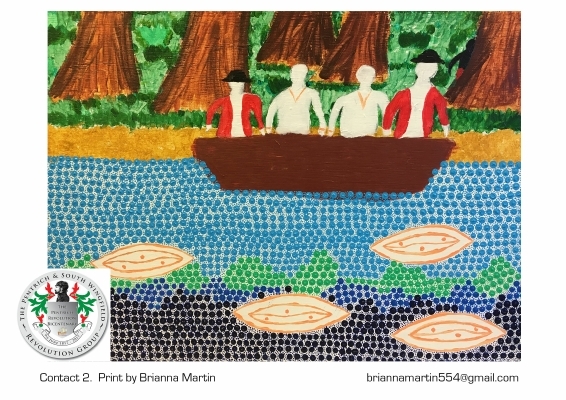 getting involved with as many art based projects as possible! I have loved drawing and painting since sitting at the dining room table as a young child, watching my Dad creating wonderful paintings in oils. I also spend a fair amount of time paper crafting, particularly scrapbooking and card making. 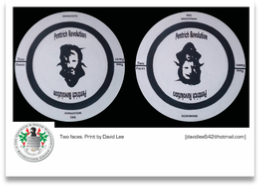 The Pentrich Revolution was one of the first attempts in history to mount a wholly proletarian insurrection without middle class support. Starvation and unemployment were the burdens of the lower class, and it was left to them to do something about it. It was a revolt of the necessary. Peterloo some two years later proved that even peaceful protest could end in bloodshed. 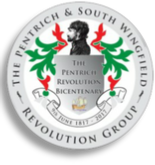 The Cato Conspiracy, The Reform Bill and Chartism and the Newport rising all followed on from here, with some of the Pentrich revolution families involved. Every group and movement through the many years of protest would eventually lead to votes for all and the political reform as petitioned for at the Crown and Anchor all those years before. We should acknowledge the role that the Pentrich Revolution played in this. I was educated at Joseph Wright school of art, I’ve lived in Swanwick for forty years and have heard of the revolution and its disastrous consequences. I enjoy painting anything, oils water colour any medium. 43. The Power of the Pen. At the time of the revolution, there were many prominent people fighting on the behalf of men. These included Joseph Strutt, a Colonel of the militia and the son of Jedediah Strutt, and Mr Higginson, a Presbyterian minister. Poets Percy Bysshe Shelley and Charles Lamb both wrote about the injustice, as well as Sir Francis Burdett, who himself was heavily fined and imprisoned in 1820 for speaking out against the Peterloo massacres of 1819. As early as June 16th 1817, Sir Frances read an item from the Leeds Mercury implicating Oliver the Spy in the House of Commons "that nothing could be more atrocious, especially in these times of wretchedness and distress, than for the government to hire and pay people to incite sedition." Wendy lives with her husband in Nether Heage. 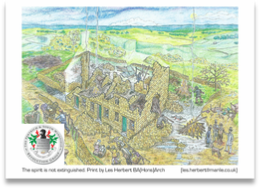 She is thrilled to be involved with the Pentrich Revolution Bicentenary as it combines her interest in local history and art. Her favourite media is pencil. She is fascinated in the way tiny pencil strokes can create an illusion, leaving the eye of the beholder to complete the picture. 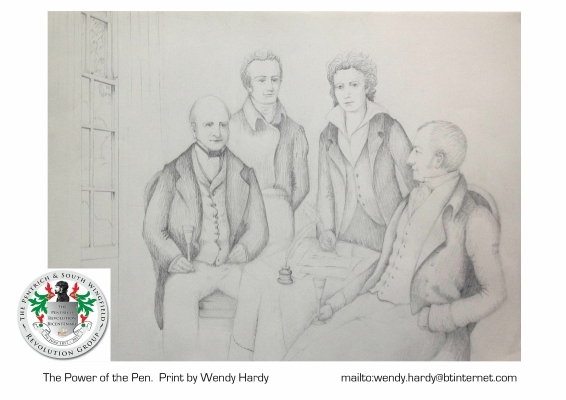 She hopes that her picture makes you consider the bravery of these personalities that spoke out on behalf of the men of the Pentrich Revolution. This painting is very interesting and unique. 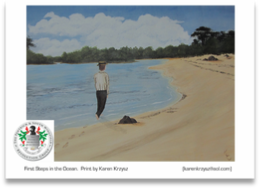 The painting is on wood, and the picture can be looked at from two different angles. One way up it is a picture of Jeremiah Brandreth, the leader of the revolutionaries. If it is turned upside down it shows Nanny Weightman, the mother of three of the revolutionaries and sister of Thomas and John Bacon, who were transported for their part in the revolution. Nanny Weightman was the landlady of the White Horse where meetings took place. The Public house was one of the buildings demolished by the Duke of Devonshire after the revolution. I have been painting and drawing all of my life really, I was always sketching family pets and doodling. I attended a tough boys school and the art teacher John Lally took me to one side and told me I had a special talent and to not go astray as some as the other boys had done in the past and not to let my talent go to waste. My major regret is that he never got to see my first exhibition in the gallery named after him in Ilkeston. My style is eclectic, symbolic and metaphorical, I use semi-abstract to create optical illusions, as with this painting. 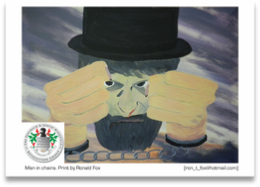 Brandreth was no sooner in prison than life became even more unbearable for him, due to the overcrowded conditions in Derby Gaol. The men facing charges for treason were placed in irons, and the amount of noisy mutinous inmates became a threat to security as there were only four special constables to guard the prisoners. Some of the men captured would never be freed from the chains again before meeting their untimely end at the gallows. 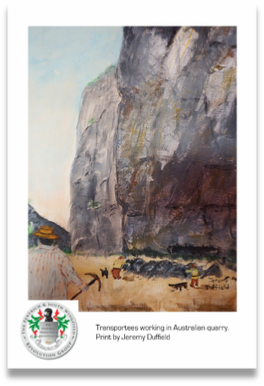 My name is Ron Fox and I am a member of the Ripley U3A Art group. 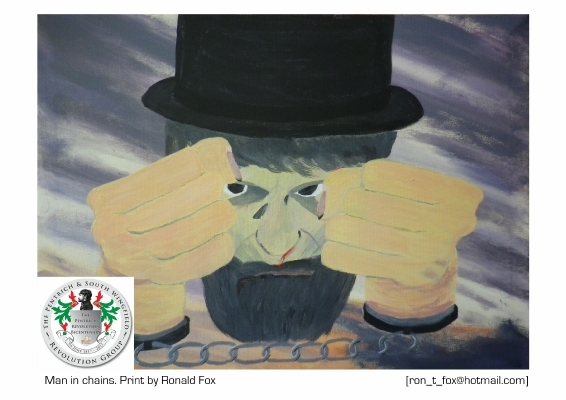 It is ‘Man in chains’ and is a little surreal.I used acrylic paint on canvas for the painting. Just for your information I have been attending the art group for about 2 years and it is the first time I have dabbled in the subject - I have had no formal (or-informal) training and just do what I can with advice as appropriate. I left the area and now live in Lincolnshire but continue to be a member of Ripley U3A in order to attend the art group sessions. I have done some research, mainly general, on the subject and I am quite interested if there were any songs written at the time. I have come across one song - The Nottingham Captain - which is based on a song written by one of the marchers. The men held in jail were released without trial by the end of 1817, and the six men convicted to sentences in this country would have been sentenced to hard labour. The words 'hard labour' accurately describes the punishment. Prisoners were often used as the main work force in quarrying, building roads or labouring on the docks. Prisoners were also set to hard labour within the prisons themselves. 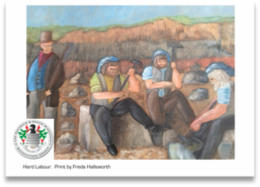 It was felt that hard labour would teach prisoners the value of hard work; secondly, it would remove the temptation for idle men to get up to mischief and thirdly, it would deter others from committing crime. It was also a cheap labour source. Most prisons in the earlier part of the 19th century had a treadmill or tread wheel installed, and the prisoner simply walked on the wheel. The treadmills provided flour to make money for the prisons, from which the prisoners earned enough to pay for their keep. However, in later times, there was no end product and the treadmill was walked just for punishment. It became loathed by the prisoners. Another equally pointless device was the Crank. This was a large handle, in their cell, that a prisoner would have to turn, thousands of times a day. This could be tightened by the warders, making it harder to turn, which resulted in their nickname of 'screws'. These punishments were not abolished until 1898. 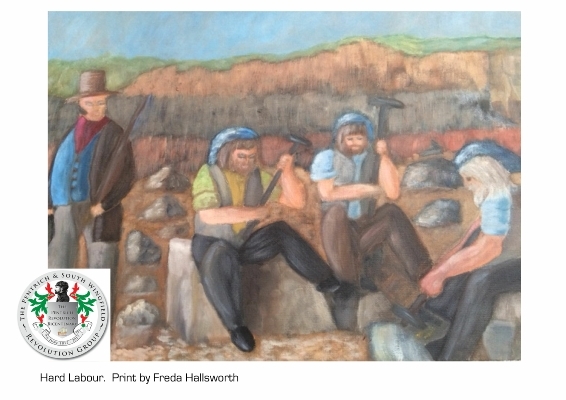 Hard Labour by Freda Hallsworth nee Ludlam. I come from a rather " revolting" family as I am descended from the Ludlam’s of South Wingfield and also have ties to the Brassingtons, Taylors and Buxtons. It is a privelege for me to be able to take part in this exhibition. This painting shows Sydney, Australia. If the convicts were on deck on either the Isabella and Tottenham when the ships arrived off Sydney Heads (they may not have been for security reasons) they would have seen sandstone cliffs towering above them guarding the entrance to the harbour. To the south, the lighthouse towered above the cliffs. The vessel had to adjust its sails to enter Port Jackson between North Head and South Head, the entrance being about three quarters of a mile across. Once inside the ship dropped anchor and the pilot – either Robert Mason or Robert Murray – came on board and took charge of the vessel in order to navigate up the harbour. The South Head telegraph communicated to the signal Station on Flagstaff Hill, Sydney that the vessel had arrived and information about the vessel and the number of convicts on board was relayed to the Governor. Once cleared, the vessel proceeded the five miles up the harbour towards Sydney Cove. 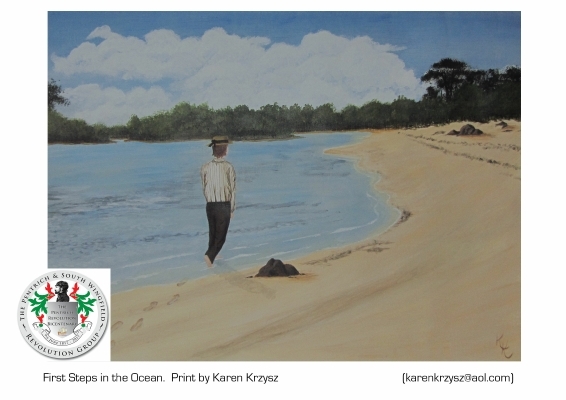 At first sight the landscape looked forbidding, with sandy beaches fringed by stunted trees between harsh rocky headlands with dense forests of gloomy green. It appeared as a primeval uncultivated region bare of any evidences of the softer, tamer results of the work of man. Philip Gardner was born and brought up in Ripley, middle child of 5 and twins above him and below him. Always had a keen interest in drawing and painting, took Art and Sculpture at "A" level at Swanwick Hall GrammarSchool with a view to continue with a foundation course in art and design at Chesterfield college but a desire to play professional football and other distractions meant that none of the above materialised. Not really picked up a brush since school but really enjoyed the challenge of trying to replicate this scene and due to his competitive instincts is not really happy with the outcome so there is a possibility he will continue with "brushing up" on his skill set in the future. Currently runs a successful mortgage brokerage in Alfreton, together with a lettings company, small property company and an LED lighting company.